December 14th–23rd, from 7-10pm. Visit Zoo Miami for a dazzling display of lights. Enjoy Holiday music, “ice-skating. hippo slide rides, camel rides, hot chocolate and cookies”. Free 3D glasses with admission fee of $5.00 per person. Visit miamimetrozoo.com for more information. Saturday, December 22nd from 4 to 8pm. Enjoy student holiday performances, carnival foods, arts and crafts, and Santa Claus himself. The event takes place at Ludovici Park in Palmetto Bay, located at 17641 Old Cutler Road. Saturday, December 22nd from 7:30-9:30pm. Parents bring your children to meet Mrs.Claus. Enjoy a classic holiday meal. Children will receive a holiday plush gift and enjoy making their own holiday ornaments and decorating holiday cookies. Admission includes free parking, admission to “Zoo Lights” with unlimited carousel rides. Space is limited so reserve your seat today. For more information, visit miamimetrozoo.com. Saturday, December 15th from 10am to noon. Children of all ages are invited to listen as Santa Claus reads some classic holiday stories next to the Christmas Tree at the Deering Estate's Stone House Ballroom. After story time, children are invited to participate in an arts and crafts activity. Children can have their pictures professionally taken with Santa for an addition fee or parents may bring their own camera and take photos for free. Admission is $12 for adults and $7 for children (ages 4-14). For more information, visit deeringestate.org. Sunday, December 16th, 10am. “Help put a toy in a child’s hand and a smile on their face.” Bring a new, unwrapped toy, to Petersons Harley Davidson and then participate in the free ride. The store is located at 19825 S. Dixie Highway. For more information phone 305-235-4023 or visit their website at petersonsharley.com. December 19th. 6:30pm Music Lounge, 8pm movie. Visit Pinecrest Gardens for this months Chick Flick Movie Night featuring the movie “Bridget Jones Diary (R). Admission is $5.00. Pinecrest Gardens is located at 11000 Red Road. For more information, visit their website. Wednesday, December 12th, 11am. The Whigham Elementary School Chorus will be preforming Christmas carols in the Center Court of Southland Mall. Stop by and enjoy the music. December 12th–15th, 9am-5pm. This annual used book sale is a fundraising event to raise funds for the library systems educational and cultural programs. The sale takes place at the Main Library in Downtown Miami at 101 W. Flagler Street. If you wish to donate books for this or future sales, you may drop them off at any library branch. Miami Dade County has announced some adjustments to bus service throughout the County. Residents who travel by bus should check to see if their route will be affected. Visit miamidade.gov for more information. Tuesday, October 4th, 7 to 9pm. The Concerned Citizens of Cutler Bay's December meeting will be a potluck social gathering. Everyone is welcome. The meeting takes place at Cutler Ridge United Methodist Church, 20740 Old Cutler Road. Saturday, December 8th beginning at 7am. The Cutler Ridge Women's Club will be having a yard sale with all proceeds donated to the Hurricane Sandy Disaster Fund. Items for sale include clothing, baby and kitchen items, chrismas decorations, tools and much more. Come help them reach their goal of donating $500.00 to this worthy cause. The yard sale takes place at 10101 Haitian Drive. Saturday, December 8th, race begins at 8am registration/sign in at 7am. Zoo Miami will be holding a 5K run/walk to benefit the Childrens Bereavement Center, an organization that provides peer support groups for children teens and young adults grieving the death of a loved one. Early registration is $30.00 online until December 5th, and $35.00 at the event. For more information, visit childbereavement.org. Zoo Miami is located at 12400 SW 152nd Street. Saturday, December 8th and 9th from 9:30am to 4:30pm. Learn to identify South Florida's butterfly species and the plants that attract them. Take a butterfly walk through the garden with an expert. Enjoy engaging kid activities. Admission to Fairchild Gardens is $25.00 for adults, $18.00 for seniors 65 and up and $12.00 for children 6-17. For additional information, visit fairchildgargen.org. Sunday, December 9th, registration begins at 10am, bike ride begins at 11am. Join your friends and neighbors for a 10 mile, police-escorted bike ride through the Town of Cutler Bay. The ride begins at the Lakes By The Bay Park, located at 8551 SW 216th St (next to Whigham Elementary). Helmets are required. Free helmets for riders 10-16 while supplies last. For more information, see the flyer or phone 305-238-4166. December 9th, 4pm. The Alhambra Orchestra will perform seasonal favorites for orchestra and choir at Old Cutler Presbyterian Church, located at 14401 Old Cutler Road in Palmetto Bay. For more information visit alhambramusic.org. November 21st 6:30pm Music Lounge, 8pm movie. Visit Pinecrest Gardens for this months Chick Flick Movie Nights featuring the movie “How to Lose a Guy In Ten Days (PG-13). Admission is $5.00. Pinecrest Gardens is located at 11000Red Road. For information on these and other upcoming events, visit their website. Friday, November 30th, 7pm. Kick off the holiday season with the Deering Estate's Annual Tree Lighting ceremony in the historic Stone House Ballroom. Enjoy live performances by the Yuletide Carolers. Admission is $12 for adults and $7 for children (ages 4-14). For more information, visit deeringestate.org. Saturday, December 1st from 9am - noon. Miami-Dade Homeowners are eligible to receive 2 free trees per year. This event will feature Mango trees only and are available on a first-come, first-served basis. The event takes place at the Gold Coast Railroad Museum located at 12450 SW 152nd Street. (enter at Zoo Miami. Also at the event residents can exchange their old shower heads for high-efficiency ones and standard light bulbs for compact fluorescent bulbs. For more information, visit miamidade.gov or phone 305-372-6784. Saturday December 1st at 4:00pm and 7:30pm. This annual musical event features an array of musical performances for an evening of filled with the sights and sounds of the Christmas season. The concert takes place at the Old Cutler Presbyterian Church, located at 14401 Old Cutler Rd. Call 305-238-8121 or visit ocpc.org for more information. Thursday, November 15, 7pm at the Cutler Ridge Park Recreational Room. At the meeting, the Civic Association will be electing a new board and talking about activities they want to develop for the community. For more information, email Fidelma.Farinas-Cobas@sunlife.com. Saturday, November 17th from 9am to 2pm. South Dade residents are invited to attend a Free Health Fair conducted by the University of Miami Miller School of Medicine. The Health Fair takes place at The Bargain Town Flea Market located at 24400 Packinghouse Road in Homestead. For a list of services that will be provided and contact information, read the press release. Saturday, November 17th, parade begins at 4pm. This annual parade at The Falls Shopping Center features marching bands, costumed characters, stilt walkers, a junkanoo band, bag pipers, a Dixieland band, and Santa himself. The festivities continue throughout the evening with three stages featuring music and dance. For more information, visit simon.com. Saturday, November 17th from 9am–5pm. St. Thomas Lutheran Church will have their annual festival featuring a rummage and local crafts sale, hamburgers and hot dogs, baked goods, and a raffle & silent auction to benefit various service organizations. For more information call 305-232-1227 or email stthomaschr@aol.com. The church is located in Palmetto Bay at 17700 Old Cutler Road. For complete Miami-Dade election results, visit miamidade.gov/elections. This week long event features an array of author discussing their latest books, book signings, and other events culminating in a 2 day street fair. For more information, go to miamibookfair.com. Wednesday, November 14th. There will be a Town Hall Meeting at Pinecrest Gardens to discuss the proposed US-1 Express Toll Lane Project. From 6-7pm there will be an informal reception, with the town hall meeting taking place between 7-9pm. A panel discussion will be led by former County Commissioner Katy Sorenson. Pinecrest Gardens is located at 11000 Red Road. November 14th, 11am to 6:30pm. Visit Temple Beth Am for a shopping extravaganza featuring over 40 venders, along with a bake sale. Temple Beth Am is located at 5950 N. Kendall Drive. Phone 305-667-6667 ext 122 for more information, or email ffrancis@tbam.org. Wednesday, November 7th, Fairchild Garden is offering free admission to the park. Fairchild Garden is located at 10901 Old Cutler Road, Coral Gables. For more information, call 305-667-1651 or visit fairchildgarden.org. Thursday, November 8th, 7pm. Mayor Edward MacDougall and the Cutler Bay Town Council invite you to attend the Cutler Bay 2012 State of the Town Address, which will take place at the Centennial Middle School auditorium. The school is located at 8601 Southwest 212th Street. Those wishing to attend are asked to RSVP by November 2nd to rsvp@cutlerbay-fl.gov. For more information, view the flier. On November 9th-11th from 9:30am–4:30pm. This 72nd annual event includes more then 15,000 plants for sale, live music, antiques and collectibles, old and rare books, and art. Enjoy live music, a farmers green market, Garden of Chocolate, tea service, a science trail, lots of food vendors and Kid Way, with face painting, live performances, games and more. Admission is $25.00 for adult non-members, $18.00 for seniors 65+, and $12.00 for children 6-17. The event takes place at Fairchild Tropical Garden, located at 10901 Old Cutler Rd. Call 305-667-1651 ext. 3344 for additional information, or visit fairchildgarden.org. November 9-11th from 11am to 11pm. (11am-10pm Sunday) Try delicious Greek food, wine tastings, traditional Greek dancing and music, along with rides for the kids. The fun takes place at St. Andrew Greek Orthodox Church, located at 7901 N. Kendall Drive. Phone 305-595-1343 or visit themiamigreekfestival.com for more information. Saturday, November 10th from 10am-1pm. Volunteers will be distributing free thanksgiving staples to residents in need at Cutler Ridge Park, located at 10100 SW 200th Street. This event is for District 8 residents only; a picture ID with address is required. Food will be distributed only while supplies last, so please get their early. For more information, call 305-378-6677. Saturday, November 10th, 9am–4pm. Old Cutler Presbyterian Church will be holding an Arts and Crafts Festival featuring homemade items, live music, and food trucks. Free admission and parking. The church is located at 14401 Old Cutler Road, in Palmetto Bay. For more information, visit their website at ocpc.org. Saturday, November 10th, 7am check-in, run/walk begins at 8am. Help in the fight against cancer by sponsoring or participating in this event taking place at the Deering Estate. There will be food and beverages at the end, along with live music. Kids can visit the Family Area, where they’ll find bounce houses and other attractions. Registration is online. For fee schedule and more information, visit reasontorun.org. Saturday, November 10th from 10am to 5pm. Kids 8 to 17 can compete in the “Young Talent, Big Dreams” auditions. There are numerous categories in which you can compete. For more information and registration forms, visit actorsplayhouse.org or call 211. The auditions take place at the South Dade Cultural Arts Center located at 10850 SW 211th Street. See the flier for more information. Saturday, November 10th from 8am to 4pm. Perrine-Peters United Methodist Church will be holding a crafts fair this Saturday. The church is located at 18301 S. Dixie Highway, Palmetto Bay. For more information, phone 305-235-2309. Saturday, November 10th from 10am-8pm and Sunday, November 11th from 10am-6pm. Visit the Fruit & Spice Park for it's 1st Annual Fish Fry. Enjoy tantalizing seafood, corn on the cob, funnel cakes, ice cream, live stage performances by local bands, along with children's activities including pony rides, fishing lessons and more. Admission is $8.00 for adults, and free for children under 11. For more information read the press release. Sunday, November 11th from 3-10pm (gates open at 2). Gourmet food provided by the Food Truck Invasion, with great music all dedicated to honoring our veterans. Tickets are $20 at the gate, $15.00 in advance. The event takes place at the Palmetto Bay Village Center, located at 18001 Old Cutler Road. Visit for ticket sales and more information. The Florida League of Cities has named Cutler Bay as the winner of their Environmental Stewardship Award for it's Go Green initiative and for it's leadership role with the Property Assessed Clean Energy District(PACE) Program. For more information about this award, read the press release. October 22nd through November 8th. The Dave & Mary Alper JCC will be having their 32nd Annual Jewish Book Festival featuring a variety of author presentations, book signings and refreshments. These events take place over a two week period at different South Florida locations. For featured books, authors, admission fees, location dates and times of the various presentations, visit their website at alperjcc.org. Friday, November 2nd, from 8pm to 11pm. Visit Norman Brothers Produce for their annual wine tasting to benefit UM/NSU CARD (Center for Autism and Related Disabilities). Taste wines from around the world, while sampling exotic cheeses, paella, smoked salmon, sushi and more from the Norman Brothers Holiday menu. Cost is $40 per person in advance, and $50 at the door. Norman Brothers is located at 7621 SW 87th Ave.(Galloway Rd). For more information and tickets, visit the facebook event page, call Michelle at 305-284-5269, or email mke@miami.edu. Saturday, November 3rd, 8am to 5pm. Cutler Ridge United Methodist Church presents their annual country fair. Enjoy a delicious chicken dinner between 11am and 4pm of chicken, baked beans, corn on the cob and soda for only $5.00. There will be crafts, free children's rides, a DJ providing music, homemade cinnamon buns, baked goods and a hotdog lunch. The church is located at the corner of Old Cutler Road and Marlin. November 3rd and 4th, gates open at 8 am, no admittance after 3pm. The Thunderbirds return to Homestead Air Reserve Base for an exciting free event open to the public. There will be various displays, food and beverages, and of course the excitement of watching the demonstration teams tearing through the skies over Homestead Reserve Base. For everything you need to know about the event, visit their website at wingsoverhomestead.com. October 19th-21st, and 26th-28th, Fridays 6pm to midnight, Saturdays, 2pm to midnight and Sundays, noon to 10pm. Join in the fun as the German American Club celebrates Oktoberfest. Enjoy German food, beer, German music and dance groups. The event takes place at 11919 SW 56th Street. For details, phone 305-552-5123 or visit the German American Clubs website at oktoberfestmiami.org. October 17th – 31st, 11am to 5pm. - Dr. Wilde's Creepy House. A haunted house guaranteed to send chills up your spine. Visit miamimetrozoo.com for more information. September 27th through October 31st. Visit Miami International Mall where the dead will come to life in their 2-acre Haunted House. Enjoy carnival rides, food and games, circus acts as well as live musical performances. Find out more and get a $2.00 off admission coupon by visiting houseofhorrorpark.com. October 31st, from 9:30am to 4:30pm. Bring your dog to Fairchild Garden for a day of four-legged fun, including a chance to show off their costumes, a doggy tram ride, samplings of doggie treats including doggie beer. Raffle for grooming products and more. For more information, visit fairchildgarden.org. Saturday, October 27th from 7-10:30pm. The Deering Estate presents fine wines and food at the 11th Annual Wine on Harvest Moon celebrating the magic of Paris. Along with the food and drinks there will be live entertainment and artwork on display. Tickets can be purchased online. For additional information, visit deeringestate.org. October 27th, 8pm (gates open at 6:30). Enjoy the music with the South Florida Jazz Orchestra as this sixteen piece big band jazz group kicks off Pinecrest Gardens' jazz season. For tickets and additional information about this and upcoming Jazz performances, visit pinecrest-fl.gov/index.aspx?page=440. October 19th–20th and 26th-27th, from 6:00-9:00pm. Join the fun as the Gold Coast Railroad presents a family fun event. Enjoy train rides, classic monster movies, grave yard dig, costume contests, trick or treat stations, food concession stand, a bounce house and a haunted house train. Cost is $5.00 for members, $8.00 for non-members. Train rides are at an additional cost. Call toll free 888-608-7246 for more information or visit their website and pre-order your tickets at gcrm.org. The museum is located at 12450 SW 152nd Street. Friday, October 26th from 6:30 pm to 9:00 pm. Visit the South Miami-Dade Cultural Arts Center Lab Theater for a celebration of Hispanic Heritage Month. Enjoy an evening of art from across the Americas. Admission is FREE. The Cultural Arts center is located at 10950 SW 211th Street. See the flyer for additional information. Saturday, October 27th, 4pm – 11pm. Music, from “One Night Rodeo”, and local groups, great food including Joe's Seafood Stone Crabs and Big Pig BBQ, all for a great cause promoting the local animal rescue orginizations. Raffle tickets $5 to win a $2500. diamond bracelet. The show takes place at the Homestead Harris Field Pavillion. For more information, visit floridarockstars.com and miaminewtimes.com. Saturday, October 27th, from 6-9pm at Cutler Ridge Park. Experience the terror of the haunted house, the adventure of the spider egg hunt, the costume contest, great food, and don't miss "Track or Treat" taking place around the walking path. Cutler Ridge Park is located 10100 SW 200th St. Call 305-284-4166 for more information or read the flyer. Saturday, October 27th from 2-4pm at Old Cutler Town Center. Bring the kids ages 3-11 for free candy from select stores and a cash prize costume contest of up to $150.00 (a parent or guardian must be present to win the costume prize). Old Cutler Town Center is located at 20425 Old Cutler Road. Saturday, October 27th from 2pm to 4pm. Kid's 12 and under can enjoy trick or treating, goodie bags, a costume contest along with creepy crafts, spooky tattoos, and prizes. The event takes place at Southland Mall, located at 20505 South Dixie Hwy. Phone 305-235-8880 for more information or visit mysouthlandmall.com. Saturday, October 20th, 9am to noon. Amscot Financial will be handing out free bike helmets for pre-school through elementary school aged children. The give-away will be in the parking lot of Amscot Financial located at 19353 S. Dixie Hwy, in Cutler Bay. For more information read their press release. Saturday, October 20th at 10:00 am. The Cutler Ridge Women's Club will have a Bunco Bash at Cutler Ridge Park. Join them for a "FUN"raiser to help our new High School!! Play bunco till noon and than enjoy a buffet luncheon. The cost is $15.00 and all proceeds go to education. Door prizes, book sale, bake sale, old fashion "trash & treasure", and raffle. Additionally, the woman's club is looking for new members. For more information and to RSVP, contact Sharon Jackson at tnsjax@aol.com or 305-238-7553 or call Ruth Perry 305-245-9255 for RSVP. Saturday, October 20th, 9am–5pm. The 35th Annual Fall Crafts Festival is back featuring homemade crafts from artists all across the country. Enjoy family-friendly events, music by local bands, a car show, and lots of delicious food. Admission is free. The event takes place at 18455 Franjo Road. October 20th and 21st from 9:30 to 4:30. Visit Fairchild Garden for their Edible Garden Festival featuring delicious food, cooking and gardening demonstrations, lectures, educational activities and more. In addition, there will be a scarecrow competition, pumpkin patch and fall beer garden. For a schedule of events and information on how to enter the scarecrow competition, visit fairchildgarden.org. Friday, October 19th through Saturday, October 20th from 9am-3pm. Christ the King Lutheran Church will have their 41st annual white elephant sale. Find Holiday items, collectables and household items along with food, a bake sale and silent auction. For more information visit their website at ctkmiami.org. Christ the King is located at 11295 SW 57th Ave., in Pinecrest. Phone 305-665-5063 for more information. Friday, October 12th, 7pm to 9pm. Residents are invited to a “Meet and Greet” for Ross Hancock, candidate for House District 114. The event takes place at the home of Oran Lindquist. For more information on Ross Hancock or the upcoming election, please visit our election page. Wednesday, October 3rd from 9:30am to 4:30pm. Enjoy the beauty of Fairchild Garden at a price you can't resist, FREE. Fairchild Tropical Garden is located at 10901 Old Cutler Rd. Call 305-667-1651 for additional information, or visit fairchildgarden.org. The next Free Day is on Wednesday, November 7th. Thursday October 4th through Sunday, October 7th. Visit Fairchild Tropical Garden for their Bird Festival. Thursday and Friday's event takes place off-site with birding tours around South Florida led by the Tropical Audubon Society. 7:30 am tours leave from the visitors center as a group. (See link for locations, cost and application to register) Saturday and Sundays events at Fairchild are from 9:30am - 4:30pm and include presentations and Q&A with experts, bird walks, and a bird attracting plant sale. For more information including lecture dates and times, visit fairchildgarden.org. Friday, October 5th, 7:00 pm. Bring the family for a night of free entertainment featuring the movie "The Lorax". Bring your lawn chairs or blankets. Admission is FREE, food and drinks will be available for purchase. For more information, contact the Town Parks and Recreation Department at 305-238-4166 or see the flyer. On Sept 27th, from 5pm-8pm, Cold Stone Creamery stores (including the store in the Old Cutler Town Center), are having an ice cream social. Get a free 3 oz sample of ice cream, and while you are there please make a donation to the Make-A-Wish foundation. For more information, visit coldstonecreamery.com. Tuesday, October 2nd 7 to 9pm. The Concerned Citizens of Cutler Bay's monthly meeting will host County Commissioner Lynda Bell. Following Ms. Bell's presentation, there will be a Q&A with candidates for the office of State Representative District 114 – Erik Fresen and Ross Hancock; and candidates for Vice-Mayor of Cutler Bay Ernie Sochin and Ed Wolmers. The meeting takes place at Cutler Ridge United Methodist Church, 20740 Old Cutler Road. Saturday, September 15th. Help keep Miami-Dade beaches and park areas clean. Closest clean up locations to Cutler Bay are Blackpoint Marina and the Deering Estate. For more information, and to register as a volunteer, visit miamidadecoastalcleanup.org. September 15th, from 10am to 4pm. Enjoy free admission as well as a Plant Detective game where participants hike to find clues about native plants. Also included is an interactive art event (1pm -2:30), and historic tours. Food and beverages will be available for an additional fee. For list of events times, visit deeringestate.com. Tuesday, September 18th, at 6:30pm. Miami-Dade County Public Schools will hold a public hearing on a proposed renaming for both Cutler Ridge Middle School and Centennial Middle School. The hearing will be held at the Centennial Middle School Auditorium, located at 8601 S.W. 212th Street. Read the notices for Cutler Ridge Middle School and Centennial Middle School more information. September 18th, 12 noon. HealthSouth Rehabilitation Hospital will be holding a complimentary luncheon at their facilities, located at 20601 Old Cutler Road. Included will be education on medication safety and safety at home, and tours of their facilities. RSVP to attend by calling 305-259-6404. Residents wishing to ride free can take the new Cutler Bay bus. Scheduled pick up locations are as follows: Saga Bay Apartments - 11am, Coral Bay Terrace – 11:30am, Calusa Cove Apartments - 11:45am, Eastridge Retirement- 11:10am, Lakeshore Apartments-11:15am and Pinewood Villa- 11:30am. September 7th, beginning at 7:30 pm. Enjoy a free planetarium star show and rooftop observatory viewing. Enjoy laser shows featuring: 8:00pm "Pop" Family Laser Show, 9:00pm Best of the Beatles, 10:00pm Pink Floyd: Echoes, 11:00pm Bob Marley, and Midnight Pink Floyd: Dark Side of the Moon. The laser show admission is $4.00 for children, $8.00 for adults. For more information, call 305-646-4234 or visit miamisci.org. September 13th-16th.This fun filled weekend benefits the Diabetes Research Institute. Sign-up begins September 1st. For more information, visit petersonsharley.com and read the flyer. Tuesday, September 11th, 7pm. The Town of Cutler Bay will hold a zoning workshop to allow residents to view the proposed plans for a new shopping center to be built on Old Cutler Road between 208th and 212th Street. The proposed center will consist of a Publix grocery store and four other retail buildings. The workshop takes place at town hall, located at 10720 Caribbean Blvd. September 12th, 6:30 to 8:00pm. Miami-Dade Public works will be conducting a community meeting to inform area residents about upcoming construction on Caribbean Blvd. The project consists of replacing the existing bridge with a wider longer bridge, adding a median, wider sidewalks and other improvements. The meeting will take place in the Council Chambers of Town Hall, located at 10720 Caribbean Blvd. For more information read the public notice and view the PowerPoint presentation. Wednesday, September 5th, 10am. The Cutler Bay town council and commissioner Lynda Bell will unveil the new bus and local bus route for Cutler Bay residents. The dedication will take place at Pinewoods Villa, located at 8420 SW 188th Terrace. Individuals wishing to attend the dedication must please RSVP by email to the following address, RSVP@cutlerbay-fl.gov. Tuesday, September 4th, 7pm. The Concerned Citizens of Cutler Bay will hold a Candidate Forum between incumbent Ernie Sochin and his challenger Ed Wolmers. The event takes place at Cutler Ridge United Methodist Church located at Old Cutler Road and Marlin. Beginning September 4th, the South Dade Cultural Arts Center will begin selling tickets for their upcoming 2012-2013 season. For a list of performances or to purchase tickets online, visit smdcac.org/shows or call 786-573-5300. The Cultural Arts Center is located at 10950 SW 211 th Street. Cutler Bay's newest restaurant, Olive Garden, had their grand opening on August 27th. Olive Garden is located at 20345 S Dixie Hwy, at the Southland Mall. The phone number is 305-278-1220. Saturday, August 18th, at 10:00-11:30 AM. Children between the ages of five to twelve may enjoy a one-and-a-half hour excursion through the diverse foliage of Fairchild Tropical Garden. In this family workshop, participants will learn about tropical plants and animals and will afterwards receive a tropical plant of their very own. To register, just call (305)-667-1651, ext. 3322. Parental or adult supervision is required for all participants. $12 per person (members), $15 for non-members. August 18th, from 10am to 4pm. Enjoy free admission as well as eco-art activities, science discovery programs, yoga demonstrations, conservation workshops and much more. For list of events and times or to register for the rain barrel workshop visit, deeringestate.com. Cutler Bay students entering the 9th grade are invited to apply for entrance into Cutler Bay's long awaited new public High School located at Centennial. Cutler Bay students get preferential acceptance into one of three academies: Coast Marine Environmental Science Academy, iprep or Liberal Arts. For more information, read the flyer, call 305-235-1581 or visit centennial.dadeschools.net. Thursday, August 16th, 7pm at the Deering Estate. The former director of the National Hurricane Center will share his expertise and present slides of the aftermath of Hurricane Andrew. To reserve a seat, call 305-235-1668. Cost is $15.00 for non-members, free for members. For more information, visit deeringestate.com. August 17th-19th from noon to 7pm. Live entertainment, along with a variety of exhibitors offering goods and services in the local community. Call 786-536-6622 for more information. Tuesday, August 7th, at 7pm. The Concerned Citizens of Cutler Bay will host guest speaker Alan Ricke, Cutler Bay's director of Parks and Recreation. All members of the public are invited. The meeting takes place at Cutler Ridge United Methodist Church, located at the corner of Old Cutler Road and Marlin Road. August 4th and 5th from noon to 5pm. This 8th Annual event takes place during the tax-free weekend, allowing parents an oportunity to shop for back-to-School bargains while the kids enjoy the fun. The event includes a pirate treasure hunt, train rides, crafts, stage entertainment, games, prizes and giveaways. For more information, visit sun-sentinel.com. Beginning mid-July several local streets will be resurfaced. The funding for this project will come from the town's share of the People's Transportation Plan (PTP) funds (Miami-Dade County ½ penny sales tax). Once started, each project is expected to be completed within 14 days. For more information, contact the town's acting Public Works Director Alfredo Quintero, Jr., at 305-234-4262. For specific area's scheduled for resurfacing, see the maps below. Monday July 23rd through Saturday July 28th. Various times and activities. Southland Mall will host a weeks worth of fun activities for kids. Games, performances, a buffalo wing eating contest, magic show, live animals and much more throughout this fun filled week. To see the schedule of events or to find out how to sign up for the wing eating contest, visit their website at mysouthlandmall.com. On Saturday, July 28th, from 10am-1pm, Commissioner Lynda Bell will be sponsoring a Back-to-School Backpack Giveaway with free food at South Dade Park. To attend and receive a free backpack, residents must obtain a ticket from Commissioner Bell's office by Friday, July 20th. Phone 305-378-6677 to RSVP or for more information. The park is located at 28151 SW 104th Ave. See the flyer for more information. The UnitedHealthcare Children's Foundation provides grants of up to $5000 for the families of children 16 years old and under with medical conditions whose health care services or equipment is not fully covered by their health insurance plan. Qualifying families can receive funding to help pay for therapy, counseling services, surgeries, prescriptions, wheelchairs, and more. If you have a child with a serious medical condition, visit uhccf.org for more information or phone 860-702-5341. Two community groups will be providing free meals for children. The Florida Department of Agriculture will be providing meals to kids and teens 18 and under from June 11th up to August 10th . To find a site near you, visit summerfoodflorida.org and search using your zip code. The Cutler Bay town council voted 3 to 2 at the June council meeting to accept the resignation of town manager Steve Alexander. Mr. Alexander served as the town's manager since the town first incorporated. Public Works Director Ralph Casals is currently serving as the interim manager. Voting to accept his resignation: Mayor Ed MacDougall, Vice-Mayor Ernie Sochin and Councilmember Sue Loyzelle. Councilmember's Mixon and Bell voted against accepting his resignation. For more information, read the recent Miami Herald article. Miami-Dade Community Public Schools will be providing free meals to children at numerous sites throughout Miami-Dade County from June 18th through July 25th. All children under 18 are eligible for meals at no cost. For a list of locations and times, visit. July 21st. Graduates from Miami Southridge, class of 1987 are invited to participate in the class reunion being held at the Peacock Garden Cafe, located in Coconut Grove. Cost is $26.00 per person in advance. You can find all the details by visiting southridgealumni.com. Saturday, July 14th and Sunday July 15th, from 9:30am-4:30pm. Fairchild Garden presents their International Mango Festival celebrating 20 years of the mango. The event features music and numerous activities throughout the event. For more information, visit fairchildgarden.org. Tuesday, July 3rd, at 7pm. The Concerned Citizens of Cutler Bay will host guest speaker Ralph Casals, Cutler Bay's interim town manager. All members of the public are invited. The meeting takes place at Cutler Ridge United Methodist Church, located at the corner of Old Cutler Road and Marlin Road. July 4th, from 9pm - 9:30pm. 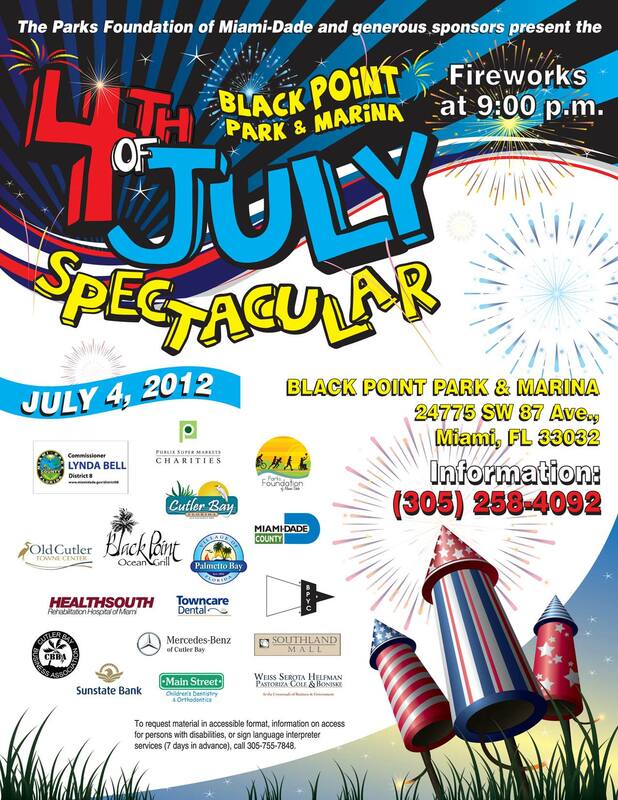 Celebrate our independence with fireworks at Black Point Marina. The marina is located at 24775 SW 87th Ave. Come early as there will be no entering or exiting during the show. You can find out more about the event by reading the flyer.For more information about the Black Point Marina, visit miamidade.gov. Wednesday, July 4th from 9:30am to 4:30pm. Enjoy your day at Fairchild Garden with FREE admission on the 4th of July and every first Wednesday of the month until November and free admission each Sunday in August. For more information, visit fairchildgarden.org. Saturday, July 7th from noon to 4pm. Thinking of You Services will host their 5th annual picnic at the U.S. Coast Guard Station, located at 16001 SW 117th Ave. To enter use the Keypad and press 001. The event features free food, entertainment and fun for the whole family. They will be collecting items to send to our troops overseas. Please bring items such as disposable razors, energy bars, wet wipes, socks, Slim Jim's, 16 oz. bags of ground coffee etc. to the event. You must RSVP to Freddie Ambrose in order to attend by contacting him at 305-252-2798. Seminar For Candidates Running For Elected Office? Tuesday, July 10th, from 6:30 to 8:30 pm. Candidates can learn the rules for running a clean campaign by attending this upcoming seminar sponsored by the Miami-Dade Commission on Ethics and the Public Trust. The seminar will cover fundraiser and record keeping, volunteers, and more. The seminar takes place at the Palmetto Bay Village Hall, located at 9705 East Hibiscus Street in Palmetto Bay (Just off Franjo before US-1). For more information, call Robert Thompson at 305-350-0630 or email him at robthom@miamidade.gov. Cutler Bay residents wishing to run for office in the upcoming November 6th election must qualify between August 6th and August 17th. For more information about how you can run in this upcoming election, contact the town clerk at townclerk@cutlerbay-fl.gov. Wednesday, July 11th from noon until 5pm. Cutler Bay residents needing assistance on issues of concern regarding Miami-Dade County items may visit the District 8 Mobile Office on July 11th at the Cutler Bay Town Center Building, 10720 Caribbean Blvd. For more information, phone 305-378-6677. For assistance throughout the year, the district 8 local office is located at 14707 S. Dixie Hwy. For more information, read the flyer. Saturday, June 23rd, beginning at 7am. Join your friends and neighbors all pitching in to build a new playground at Lakes By The Bay Park. The park is located at 8551 SW 216th St (map). For more information about the playground, contact the town's Parks and Recreation Department at 305-238-4166 or read the flyer. Beginning June 23rd, at 8pm. This first concert of three features multi award winning jazz duo Davis and Dow. Additional artists include jazz saxophonist Jesse Jones Jr. on July 28th. August 25th's featured artist the Gary Thomas Jazz Ensemble. Single tickets are $20 or purchase tickets for the three-concert series for $55. Gates open at 7pm. Arrive early for preferred seating. Bring along your own refreshments to enjoy during the show. The event takes place at the Deering estate. For more information, visit deeringestate.org or phone 305-235-1668, ext. 233. Friday, June 29th at 7:30 (Movie begins at 8pm). Bring your family to Cutler Ridge Park to see the family friendly movie, "Puss in Boots". Admission is free, refreshments available for purchase. Bring your lawn chairs and blankets. For more information, call 305-238-4166. Sunday, July 1st from 11am to 1pm. Kids can participate in a free mango-themed cooking class for kids 5 to 12. Kids will enjoy preparing mango smoothies, pizza and popsicles. Reservations to participate is required. Phone 305-667-1651 ext. 3303. This event is free, so guests are limited to 2 per participating child. For more information, visit fairchildgarden.org. The Town of Cutler Bay and the Miami-Dade County School Board have reached an agreement to start a high school at Centennial Middle School. The new school will begin this August with approximately 150 students starting in the 9th grade, with additional grades added each year. The school will include a liberal arts program, a Cambridge program, an iPrep academy and a continuation of the C.O.A.S.T program. Register your 3 to 6 year olds for the Super Summer Kids Camp at Cutler Ridge United Methodist. This 9 week camp for kids has a morning and a full-day camp available. To reserve your child’s spot, or for more information, call Janice Nelson at 305-235-6654. Wednesday, June 13th, 7pm. The town will be holding a workshop to review the latest draft of the Land Development Regulations. Thanks to public input, numerous changes have been made since the first draft was introduced in April. Come to the workshop and voice your opinion. The workshop will take place at town hall, 10720 Caribbean Blvd. Saturday, June 2nd, from 9am–5pm and Sunday June 3rd, from 9am–3pm. The Tropical Audubon Society is holding a native plant sale. Experts will be on hand to help you find just the right plant for your yard. The plant sale takes place at 5530 Sunset Dr. (Parking entrance of 55th Ave.) For more information, phone 305-667-7337 or visit tropicalaudubon.org. Sunday, June 3rd, from 4pm-8pm. The Tropical Audubon Society will be holding their tri-annual food truck migration. The event includes 12 food venders, a bar, and nature trails all within the confines of the beautiful 3-acre plant filled oasis. The event takes place at 5530 Sunset Dr. (Parking entrance of 55th Ave.) For more information phone 305-667-7337 visit tropicalaudubon.org. Tuesday, June 5th, at 7pm. The Concerned Citizens of Cutler Bay will host an evening with former County Commissioner Katy Sorenson. The meeting takes place at the Cutler Ridge United Methodist Church, located at the corner of Old Cutler Road and Marlin Drive. Ms. Sorenson will speak about her new role in the “Good Government Initiative”. For more information, visit goodgov.net. Wednesday, June 6th, doors open at 6pm with refreshments served, followed by Mayor Gimenez speaking on the state of the County and future improvements and development. There will be a Question and Answer period after his remarks. The event takes place at the Deering Estate Ballroom in the Stone House. The Deering Estate is located at 16701 SW 72nd Ave.
Friday, June 8th at 7:30 (Movie begins at 8pm). Bring your family to Cutler Ridge Park to see the family friendly movie, Puss in Boots. Admission is free, refreshments available for purchase. Bring your lawn chairs and blankets. For more information, call 305-238-4166. Saturday, May 19th, 7am to 3pm. Join professional, amateur and junior fishing enthusiasts as they compete for $20,000 in cash prizes. The weekend event kicks off Thursday, May 17th, with dinner at the Captains Party; the fishing competition takes place on Saturday May 19th with the festivities concluding on Sunday, May 20th with an awards ceremony, food and music. For more information, visit bluewaterfishingclassic.com. May 25-27th, 9:30am to 4:30pm. Visit Fairchild Tropical Botanic Garden for this Annual Show and Sale. Experts and enthusiasts alike will display and discuss this drought tolerant plant. Presented by the South Florida Cactus & Succulent Society. For more information, visit fairchildgarden.org. May 26th, 9am. The Miami Fins Semi Pro football team will be hosting a meeting at Bel-Aire Park for all players 18 and older who are interested in trying out for the team. They will also be also hosting an NFL Style Football combine at the park on June 23rd from 9am – 12pm. Visit miafinszone.com or call Joanie Manas at 786-339-3520 or DeMario Lee at 305-247-1116 for more information. Wednesday May 16th, 7pm at Town Hall. The town is set to approve new land development regulations (LDRs). These regulations were passed at first reading last month and are set for a final vote on May 16th. You can read the LDRs starting on page 36 of this month's town council agenda. May 10th, 5pm at Town Hall. The town council will hold a Special Meeting to discuss transition arrangements for the office of the town clerk and “such other matters as may be raised by council members”. Friday, May 11th from 9:30am to 4:30pm. Celebrate National Public Gardens Day with free admission to Fairchild Gardens. For more information, visit fairchildgarden.org. Southridge High School's award winning Drama group, has the opportunity to attend the International Thespian Theatre Festival, held this June in Lincoln Nebraska. They have raised most of the needed funding but are still short of their goal and have until May 7th to raise the money for the trip. Financial contributions may be made by check, made out to “Miami Southridge Senior High” with a memo: “Drama Club Donation”. Please attach a letter stating you wish to contribute the money to the drama club for their club activities. For more information, read the letter and contact the school's Theater Arts Director Paul Lobeck at plobeck@dadeschools.net or at 786-417-3825. May 1st, at 7pm. The Concerned Citizens of Cutler Bay will host a presentation by Laura Reynolds, Executive Director at the Tropical Audubon Society. The meeting takes place at the Cutler Ridge United Methodist Church, located at the corner of Old Cutler Road and Marlin Drive. May 5th beginning at 4pm until 10am on May 6th. Join the residents of Cutler Bay and Palmetto Bay as they join to raise money for cancer research at the Palmetto Bay Village Center, located at Old Cutler Rd and Sw 184th St. For more information visit. Saturday, May 5th from 10am to 5pm at the South Dade Cultural Arts Festival. This years festival highlights include performances of the Ugly Ducklings, The Tortoise and the Hare, puppet and magic shows, live dance, theater and musical performances. Admission is FREE. For more information, visit smdcac.org. Saturday, April 28th, from 7-11pm. Visit the zoo for a chance to sample over 100 kinds of beer from around the globe. Live performance by Alien Ant Farm, The Spazmatics and King Louie and the Bushman. Tickets are $30 pre-sale, $40 at the door and $70, VIP admission. Tickets and more information are available at microapp.miaminewtimes.com/zoobrew/2012/. Saturday, April 21st, from 10am to 8pm and Sunday, April 22nd, from 10 am to 6pm. Visit the Fruit and Spice Park for award winning BBQ's, live entertainment featuring Jay Blues Band, Black Star, Pit Bull Blues Band, and country artist Matt Mansfield. Admission is $5.00 for adults and free for children under 11. Visit fruitandspicepark.org for the entertainment schedule. The event also includes children's activities, petting zoo, and pony rides available. The Fruit and Spice Park is located at 24801 SW 187th Ave., in Homestead. For information, call 305-247-5727. April 21st and 22nd from 11am to 4pm. Enjoy “green activities” and the world's largest flowering tree plant show and sale. Turn in an old cell phone and come in free of charge. For more information visit miamimetrozoo.com. April 21st and 22nd from 9:30am to 4:30pm. Visit Fairchild Garden for the Bromeliad Show and Sale. Visit fairchildgarden.org for more information. Fairchild Garden is located at 10901 Old Cutler Road. Sunday, April 22nd, from 8am to 6pm. Visit Cutler Bay's Farmer's Market for an Earth Day celebration. There will be food, art, music by Tamboka and other local musicians. Kids will enjoy participating in fun project teaching about recycling, composting and conservation. There will be a sign up sheet for the community garden and more. Visit their facebook page at facebook.com. Sunday, April 22nd, noon to sundown. Come celebrate Earth Day with a free concert, drum circle, delectable, locally- grown foods, cooking classes, and more. The event takes place at The Farm @ Verde Gardens, located at 12690 SW 280th Street, Homestead. Please visit their website for more information at earth-learning.org. On Monday, April 23rd, from 9:30am to 4:30pm, Fairchild Garden will offer free admission to celebrate Earth Day. Fairchild Garden is located at 10901 Old Cutler Road. Visit fairchildgarden.org for more information. Saturday, April 14th through Sunday, April 15th, from 9:30 am to 4:30 pm. Get tips and recipes during the culinary and gardening demos. Find out how to pick environmentally friendly plants, Visit the farmers market, for fresh fruits, vegetables, herbs, honey, backed goods and more. Kids will enjoy the activities in the Kidsway. Take home a plant from the 33rd Annual Spring Plant Sale. For more information, visit fairchildgarden.org. April 15th, from 11am-5pm at the Palmetto Bay Village Center. Local restaurants and individuals compete to make the best chicken wings. There will be music with local bands, vendors, and a raffle for a Harley-Davidson Iron 883 motorcycle. Admission is $5 per carload. Proceeds from the event will help support the service initiatives of the Rotary Club of Perrine-Cutler Bay/Palmetto Bay. For more information, read the press release. You can also see the flyer at pcrpbrotary.org. Sunday, April 15th, 11am to 4pm at Pinecrest Gardens. This free event includes the weekly farmer's market along with wildlife shows, plant exhibitions, green vendor boots, eco-friendly workshops, the Greater Miami Youth Symphony concert, school talent shows, and great food. Pinecrest Gardens is located at 11100 Red Rd. For more information, call 305-669-6990 or visit pinecrest-fl.gov. April 21st is clean up day as thousand of volunteers work to cleanup our shoreline. You too can show your love of the environment by registering to help. The deadline for volunteering is March 30th. To find out how to register for this event and to find out more about all the other events, visit miamidade.gov. Saturday, April 14th, registration beginning at 7am, run beginning at 7:45am and Walk starting at 8am. Registration is now open for this yearly event. For more information and to find out how to pre-regiser, visit greatermiamicontinentals.com. April 3rd from 7 to 9pm. The Concerned Citizens of Cutler Bay will host a presentation by a group headed by the Buoniconti family about the boat storage warehouse at Matheson Hammock Park that has been granted County approval. Also on the agenda is a presentation by the dockmaster of Black Point Marina, Ken Maxwell. The meeting takes place at the Cutler Ridge United Methodist Church, located at the corner of Old Cutler Road and Marlin Drive. March 29th through April 1st. Four days of terrific music with free admission. The event takes place at 50 Merrick Way in Coral Gables. You can read the flier or visit bierhaus.cc for more information. On Saturday, March 31st from 8:30pm to 9:30pm, join millions of people across the world as they turn off their lights for one hour to raise awareness about climate change. For more information, visit earthhour.org. Enjoy South Florida’s freshest fish and seafood while taking in the magical sights & sounds of the Caribbean on Sunday, March 25, 2012 from 10:00 am to 6:00 pm. Activities include: music, celebrity chiefs, pontoon boat rides, an artists' village, crafts and jewelry, nature hikes and tours of the historical Deering Estate and more!. Bring your family and friends and plan to spend the day! $15.00 in advance or $25.00 at the gate. For more information, visit deeringestate.com. March 17th, 8 pm (pre-show Blues and BBQ, 5:30pm-7:30pm). See Grammy Award-winner James Cotton with a blast-furnace sound, a larger-than-life personality, and massive fame, “Mr. Superharp” is a blues giant in every aspect. The New York Times adds, “Cotton helped define modern blues harmonica with his moaning, wrenching phrases and his train-whistle wails.”. For more information, visit smdcac.org/james-cotton. For more information call 786-573-5300 or visit, smdcac.org. The South Miami-Dade Cultural Arts Center is located at 10950 SW 211 St., in Cutler Bay. Tuesday, March 6th, from 7-9pm. The Concerned Citizens of Cutler Bay will be hosting their monthly meeting. This months meeting will include a presentation about a proposed development on the "potato field" at the intersection of Marlin Road and Old Cutler Road; “The Shoppes of Cutler Bay”, including a new Publix supermarket. Following the presentation, there will be an open, round table discussion about items of public interest. The group will be meeting at their new location, Cutler Ridge United Methodist Church, at the corner of Old Cutler Road and Marlin Drive. For more information about the project, see the story below in COMMUNITY ANNOUNCEMENTS. Friday, March 9th - Sunday, March 11th, from 9:30am - 4:30pm. This event features more than 10,00 orchid from vendors from around the world, walking tours, workshops, great food and entertainment. Fairchild Garden is located at 10901 Old Cutler Road. For more information, visit fairchildgarden.org. March 10th, from 10am-2pm. No longer able to care for your exotic pet? You can surrender your exotic pets, free of charge with no questions asked during Metrozoo's Non-Native Amnesty Day. For more information, visit miamimetrozoo.com. Saturday, March 3rd, from 11am-5pm. Join our neighbor to the north as they celebrate the 10th annual "Taste of Pinecrest" at Pinecrest Gardens, located at 11000 SW 57th Ave. This event features art exhibits, music, rides and activities for the kids, and of course food from local restaurants. All proceeds benefit Pinecrest's local schools. Admission is free. For additional information, visit pinecrestbusiness.com. Entry to the festival is FREE! Saturday, February 25th at 7pm (Gates open at 6:30).Bring your blanket and picnic basket to the Doc Thomas House and enjoy an outdoor concert featuring Solar Dogs. Admission is $10. A cash bar will be available. Monies collected will be used for capital improvements to the grounds and historic buildings. For more information visit, tropicalaudubon.org. Sunday, February 26th from 11 am to 6pm.. Enjoy music by the Road Kings and the Mosquito Heads, enjoy food from local restaurants, visit a petting zoo, and much more. Admission is $5.00 entrance fee at the gate, or free if you pick up tickets beforehand at participating local restaurants. Find out more at thetasteofthebay.com. Friday, February 24th. Visit Pinecrest Gardens for a concert featuring Grammy Award Winning musician Stephen Marley. The concert takes place at 9:30 pm., admission is $40.00. You can make a night of it by enjoying dinner and desert before the concert along with an open bar and silent auction. Dinner starts at 7pm and cost is 125.00 per person. For more information, phone 305-669-1028. Pinecrest Gardens is located at 11000 Red Road. For more information, read the flier here. Saturday, February 25th from 9am - 5pm, and Sunday February 26th from 9am to 3pm. The Tropical Audubon Society will be having their Native Plant Sale. Create an urban oasis in your own backyard. The sale takes place at the Doc Thomas House, located at 5530 Sunset Drive. For more information, visit tropicalaudubon.org. For a list of native plants that need less water and are best suited for our community, visit regionalconservation.org. February 18th-20th, from 10am-6pm. Enjoy one of the nation's premier outdoor Fine Arts Festival. Visitors enjoy beautiful art work, fine cuisine and live entertainment. The fair takes place in Coconut Grove along the streets of McFarlane Road, South Bayshore Dr. and Pan American Drive. Admission is $10 per person per day. For more information, visit coconutgroveartsfest.com. Saturday, February 18th beginning at 8pm. (Gate opens at 6:30). The second of this eight concert series features The Harvey Nevins Orchestra. Let the music transport you to the big band era as you enjoy jazz under the stars. Tickets are $20-$25. For reservations, online ticketing, or for additional information about this and other concerts in the series, visit pincrest-fl.gov or call 305-669-6990. Saturday, February 18th from 10:00 am to 5 pm. - Free with the price of Estate Admission. Saturday, February 18th from 6:30 pm to 10:pm. - Free. Spend your day and evening enjoying a multitude of Art exhibits and performances. For the schedule of events, visit deeringestate.com. Tuesday, February 14th, visit the Deering Estate for a romantic concert under the stars on the edge of Biscayne Bay. The concert features Sarah Packiam and Scott Kirby. The gate opens at 7pm and the concert begins at 8pm. Tickets are $20. Guests can bring blankets, lawn chairs, & picnic baskets. Limited refreshments will be available for an additional fee. For more information, call 305-235-1668 ext. 233. or visit deeringestate.org. On November 17th, Cutler Bay broke ground on approximately 7.5 million dollars in improvements taking place on Old Cutler Road. The improvements include reconstructing the existing two lanes of traffic with curb and gutters, enhancements to the existing shared use path, drainage improvements, street lighting, traffic signalization and landscaping. Additionally, traffic circles will be built at both 87th Ave. and 97th Ave. The project had been delayed due to a dispute over what enhancements would be included in the project. The improvement project, which will take 18 months to complete, is being funded entirely by Miami-Dade County. Tuesday, February 7th at 7pm. The Concerned Citizens of Cutler Bay will be hosting their monthly meeting. This months speakers include Cutler Bay's Public Works Director, Ralph Casals with an update on the Old Cutler Road improvements. Additional discussions will focus on the town's charter revisions, and high school in Cutler Bay. The group will be meeting at their new location, Cutler Ridge United Methodist Church, at the corner of Old Cutler Road and Marlin Drive. January 27th through the 29th. This annual event takes place at the Doc DeMilly Rodeo Arena at Harris Field located at US-1 and Campbell Dr., Homestead. Tickets are $15.00 at the gate for adults, and $5.00 for children. Free Rodeo Parade on Saturday, January 28th, at 11am in downtown Homestead. For times and additional information, visit homesteadrodeo.com. Saturday, January 28th at 7pm (Gates open at 6:30).Bring your blanket and picnic basket to the Doc Thomas House and enjoy an outdoor concert featuring Dr. Steve Chavoustie and his Nightscape band playing classics from the 60's through the 90's. Admission is $10. A cash bar will be available. Monies collected will be used for capital improvements to the grounds and historic buildings. For more information, visit tropicalaudubon.org. Thursday, January 12th, reception at 6:30 pm, program at 7:30 pm. Commissioner Lynda Bell will present the State of the District address. This free event takes place at the South Dade Cultural Arts Center, 10950 SW 211 Street. For more information, call 305-378-6677 or visit. Friday, January 13th, 7-9:30pm. Visit Pinecrest Gardens for a screening and discussion of the documentary “Carbon Nation”, a film about climate change, the issues and solutions. A follow-up discussion will follow the viewing. For more information, phone 305-431-4942. January 14 & 15, from 10am-5pm at Pinecrest Gardens. Come see one of Florida's premiere juried art shows where you can enjoy an afternoon surrounded by spectacular visual arts in a lush and luxurious setting. You can buy or just browse the booths featuring some of the best artists and artisans in this area and beyond with works that include paintings, photography, sculpture, original jewelry, mixed media and more. Good food, fun for kids, live music with free admission for all. For more information, visit http://www.pinecrest-fl.gov/. Friday, January 20th through Sunday, January 22nd, from 9:30am until 4:30pm. Visit Fairchild Garden for their 6th Annual International Chocolate Festival. This event will feature chocolate treats, along with coffee and tea. Enjoy cooking demonstrations, informative lectures, and tree sales. The event takes place at Fairchild Tropical Garden located at 10901 Old Cutler Rd. For schedule of chef demonstrations, lectures, yoga,and more, visit fairchildgarden.org or call 305-667-1651 ext. 3344. Saturday, January 21st. Starting time is 10-11am with the event ending at 5pm. An event for car enthusiasts, history buffs and those who enjoys a leisurely drive through rural South Miami-Dade County. Participants start at Cauley Square, located at US-1 and 224 Street where they receive a map, driving directions, and a series of questions to be answered along the way. The event moves on to other Homestead destinations. The cost is $10.00 per car team. For more information visit, redlandriot.com or email info@redlandriot.com. January 21st and 22nd, from 10am-5pm. Visit the Redland Fruit and Spice Park for this annual festival featuring live entertainment, historical exhibits, Native and tropical fruit trees for sale along with local fruits and vegetables. The kids will enjoy wildlife shows, pony rides, face painting, water walking and a petting zoo. Admission is $8.00 for adults, free for children under 12. The park is located at 24801 S.W. 187th Avenue, in Homestead. Phone 305-247-5727 for more information. On December 1st, our county commissioner, Lynda Bell, and 6 other members of the County Commission voted “Yes” to allow a commercial development the opportunity to build outside the Urban Development Boundary, against the advice of the county's own planners. The Tropical Audubon Society is asking citizens to join them in asking Mayor Carlos Gimenez to veto this decision. The email address for Mayor Gimenez is mayor@miamidade.gov. Saturday, January 7th, at Cutler Ridge Park from 11am to 3pm. Cutler Bay will be holding their 3rd chili cookoff with prizes awarded for the best chili, salsa and corn bread in cutler bay. Chili tastings and entertainment for the whole family. To participate in the contest or for more information, contact Fred Bobson at 305-238-4166. Concerned Citizens to Discuss "A High School in Cutler Bay"
Concerned Citizens of Cutler Bay will host an open discussion, “A High School in Cutler Bay”, at their January 3rd meeting, from 7-9pm at their new meeting location, Cutler Ridge United Methodist Church, 20740 Old Cutler Road. All residents are invited. Listen, ask questions, and make suggestions. 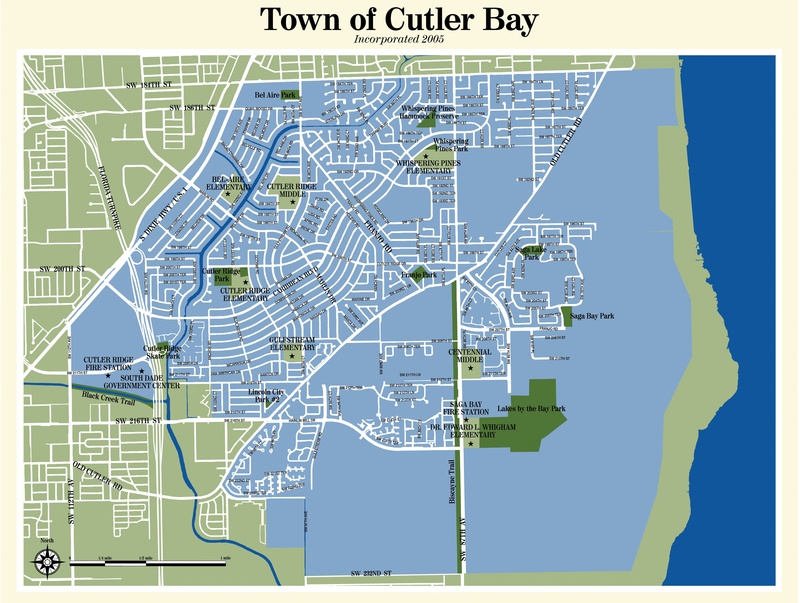 The town of Cutler Bay has held two public input meetings to discuss approximately $10 million dollars in improvements that will be taking place on Caribbean Blvd. between Coral Sea Rd. and SW 87th Ave. Below are documents provided by the town at these meetings. Questions and responses from the first meeting. The presentation from the November 10th meeting. For more information on the project, call 305-234-4262 or visit town hall on Wednesdays from 11am-2pm to speak with the project engineer. Do you want to express your opinion on the project? Send an email to the town council by clicking this link. Knaus Berry Farm is now open for the season. Enjoy fresh produce, baked goods, milkshakes, and more. Hours are 8am-5:30 pm, Monday-Saturday. Knaus Berry Farm is located at 15980 SW 248th Street, in the Redlands. Phone 305-247-0668 for more information, or visit, knausberryfarm.com.